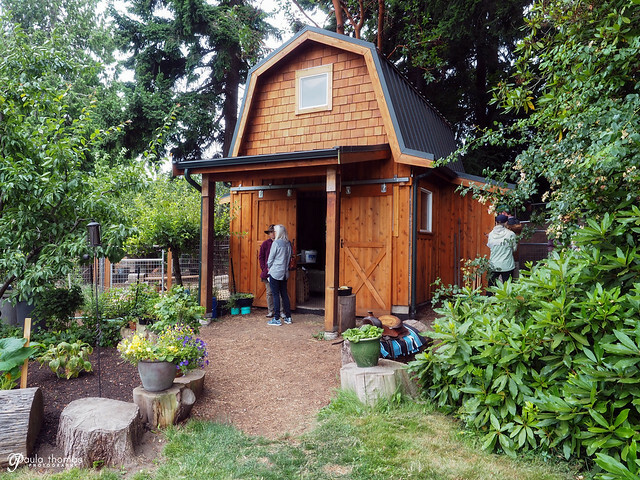 Seattle Tilth put on an urban farm tour that consisted of 25 different farms to visit in 6 hours. I don't think there's any way to have done them all in that amount of time. We studied the various farms and decided to stick to the 15 located in North Seattle and we made it to 11 of them. It was impressive what some of these urban farms had going on in such small spaces. All of them had chickens and gardens and some had bees, ducks, rabbits and even goats. Below are the farms we visited in the order we visited them. 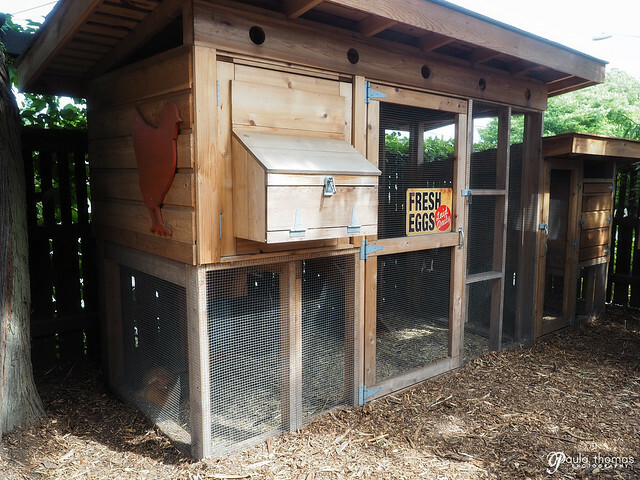 They have a few friendly chickens with a nice chicken coop setup. In back of the chickens was their raised bed gardens. Several of the beds had bottles sticking out of the sides which they claim helps to keep the soil warm. This was the only warre beehive we saw during the tour. I don't know too much about this type but would like to learn more. They also had a garden and a chicken coop that matched the house. 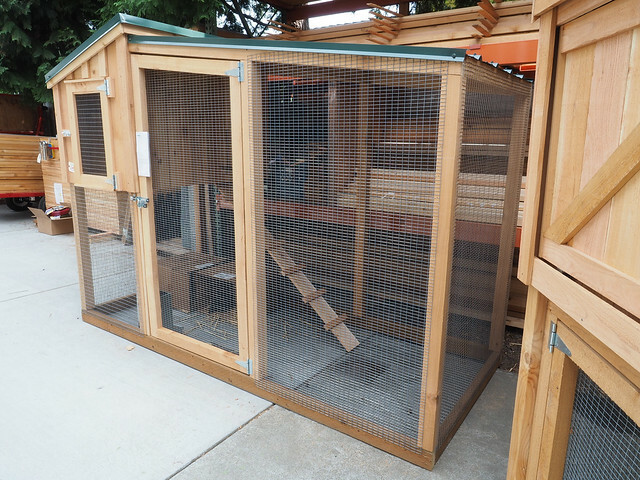 This place has three chickens (and 3 baby chicks in a box) and two rabbits though we never saw the rabbits. There were some impressive tunnels all around the backyard for the chickens and rabbits to run through. If you don't want to deal with making raised beds out of wood, one idea is to do what they did and use livestock water/feed troughs. This farm is called "Little Farm" but it's not so little compared the others. In fact it was the largest at 1/2 acre, the same size as my property. You can tell she put a lot of hard work into this place. There's a little bit of everything including chickens, ducks, goats, rabbits, bees and a large garden with fruit trees and a great barn. I thought my 1/2 acre was a lot of work but this place looked like more of a handful but a rewarding one. It was voted our favorite urban farm on the tour. 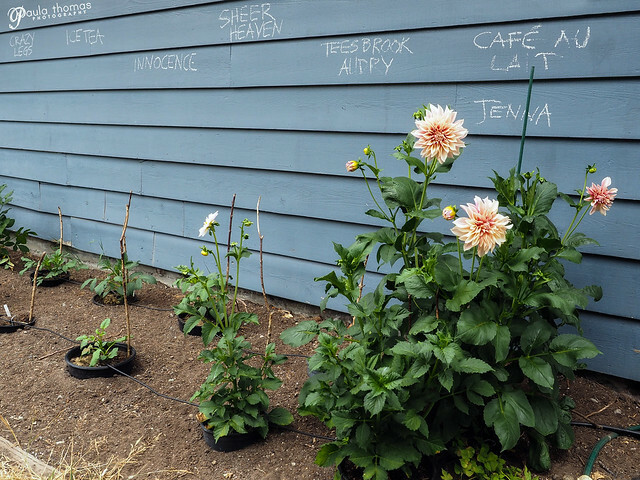 This urban flower farm grows flowers for local florists and events. Why bother with writing labels on little tags when you can just write them on the siding of your house? I thought that was cute. They also have several friendly chickens, some of which were roaming freely in the yard. I recognized one as a sicilian buttercup by the unique crown shaped comb on her head. I found it amusing that she was growing several varieties of rare veggies that I'm growing in my yard too. I found some tronchuda kale and ozette potatoes which aren't varieties you see every day. 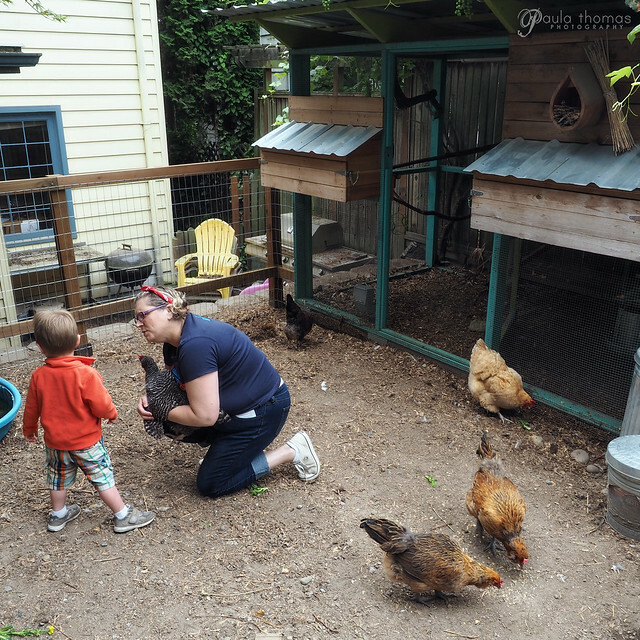 This was probably the smallest urban farm we visited but they seemed to make the most of it. When we arrived a woman was enjoying braiding some softneck garlic. 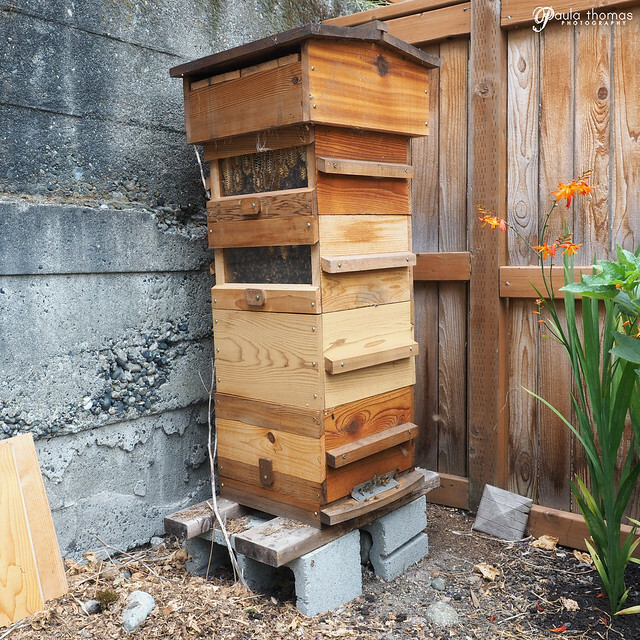 I was surprised to see 3 langstroth hives in this small yard. 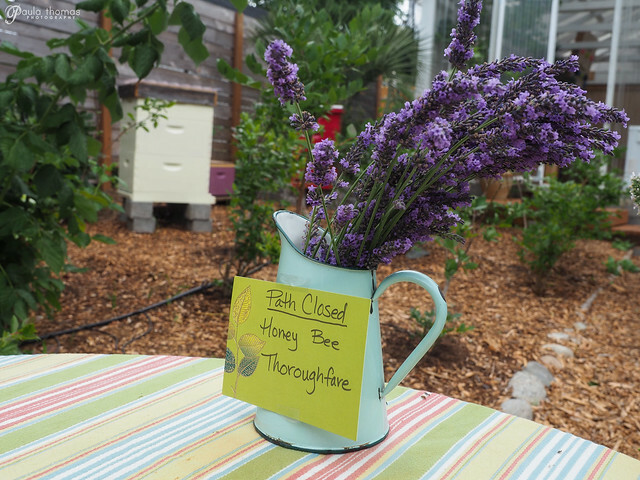 The yard was full of bees and a path near the hives was closed off for bee traffic. They also had chickens, a good sized garden and a greenhouse with citrus trees in this small backyard. 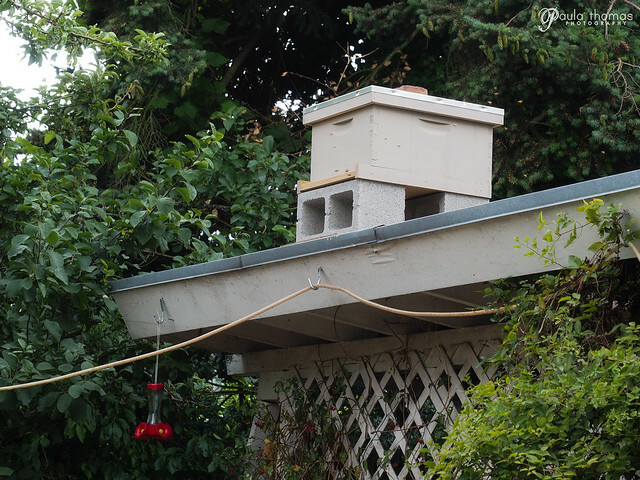 We spotted a strange contraption with a window on top that was a solar bees wax melter. 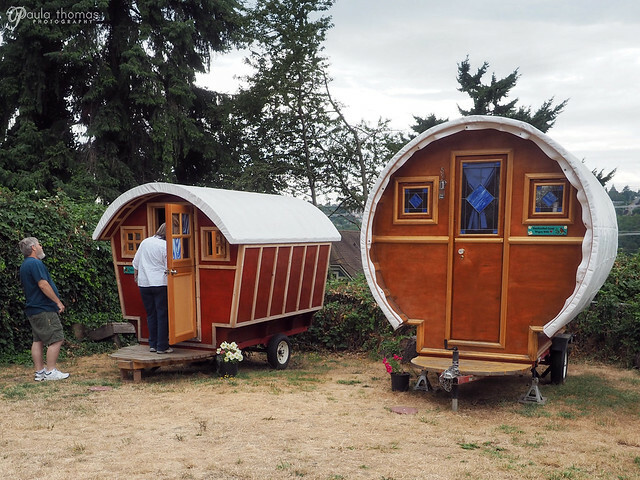 This farm houses two homemade Gypsy Wagons that are rented out as a bed and breakfast. We weren't allowed to check out the one on the right because there were people renting it. They also have some cute rabbits with big fluffy ears. They also had chickens that roamed along the hill on the back side of the property and supposedly one of the largest chicken runs in the city. This farm had multiple owners. The garden landscaping is kept up by multiple tenants in the apartment building. I'm not sure if it's a requirement to be a gardener to live here but it seemed like most of them were. Each tenant has his own area. 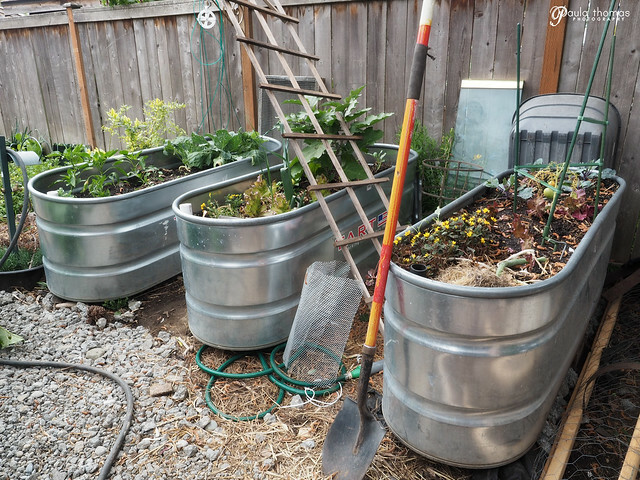 There were lots of containers and raised beds everywhere. They even had an area where they were growing mushrooms on pallets. 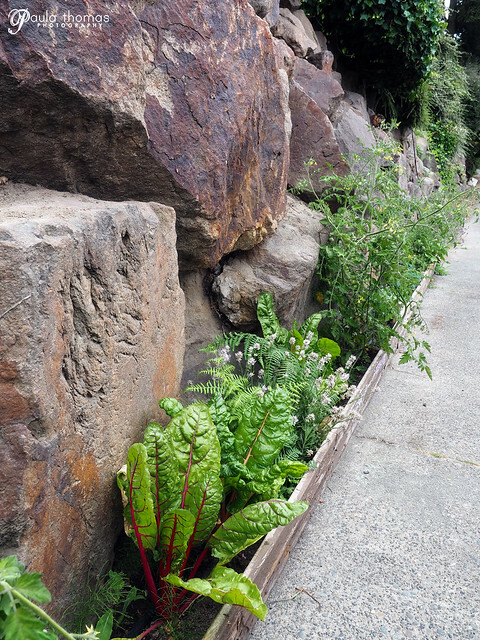 They even had some vegetables growing below the property along the sidewalk. The chickens had a nice big area to roam around and tunnels to hide in. They also had a beehive but it didn't sound like they had much experience in beekeeping and could use a few classes. This was basically a home workshop that makes chicken coops. It was an impressive workshop but I wouldn't call this an urban farm. He did have one of the chicken coops set out with a couple of chickens in it but it was pretty obvious that they weren't full time residents. There was a little parking strip garden out front and an oversized trellis with what looked like grapes growing up it.. When we arrived, it felt like we were crashing a party we weren't invited to. There were some empty bottles of wine on a table and a group of people talking and drinking. They had a small shady backyard and the bees were surprisingly up on top of a roof which seems a hard place to do an inspection. It was only one box high and probably put on the roof to get a little more sun. They also had a couple of chickens in a small run and a garden. We barely made it to this last house. It was a small yard on a corner lot. They had a lot of neat garden art around the front part of the property mixed in with their veggies and fruit trees. They had decided to get rid of their grass and turn the whole yard into an edible landscape with the chicken run and coop in the back. We just missed the chickens free ranging but saw them taking it easy in the coop. They have two separated flocks of chickens because they just don't get along so they have two coops next to eachother and lets them out to free range the backyard separately.